Jumbo the elephant, llamas, crocodiles, peacocks, and two regal lions are just a few of the wild creatures you'll discover on a visit to Lucy and Nat Day's garden in Greenwich, CT. No, there isn't a mini zoo tucked away in Fairfield County. The garden, "Where the Wild Things Are," is home to a menagerie of animal topiaries in what has become one of the finest topiary gardens in North America. Lucy was always an admirer of topiaries and became even more enthralled when she traveled to England in her twenties, finding inspiration among the English gardens she visited. Luckily for her, Nat shared her love of topiaries. After creating a few small topiaries in their greenhouse in Greenwich, the two set off to create their topiary paradise. In 2001, the Days purchased the property behind their home, adding two-thirds of an acre to their property. With the expansion of their home, the gardens needed to be redone. As Lucy says, "it was an opportunity to [create] something I have always longed to have: a topiary garden." After a fortuitous meeting with renowned English topiarist Steve Manning, the Days invited him to come to the states. Manning helped them begin the process of turning their vision into living topiary wonders. Years later, the Days met Matt Larkin, acclaimed topiarist and current chair of the board of Berkshire Botanical Garden, who assisted them in creating even more. The Days have continued adding topiaries over the years and now maintain a total of twenty-two unique topiaries among ten vignettes throughout the garden. The Days have welcomed the public into their garden many times through Open Days since joining the Garden Conservancy in 1990. "It has been a pleasure. Gardeners are good people, and they're interesting, respectful, and, fun. So it's been a lot of fun for us to have the garden open," Lucy says. They opened their home and garden one last time during their final Garden Conservancy Open Day on Sunday, September 30. 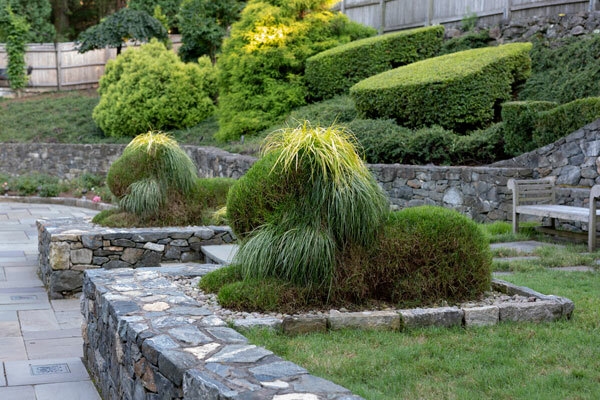 While they are selling their home, the Days have donated their topiaries to Berkshire Botanical Garden (BBG). This fall, a specialty plant mover will dig and transport them to their new home in Stockbridge, MA, where they will occupy the newly created "Lucy's Garden." The Days are passionate about garden conservation and preservation and are thrilled that their garden will be preserved at BBG. "We are so fortunate to be able to move our topiaries to a public botanical garden where it will be well maintained and enjoyed by many people," says Lucy. The Days initially imagined that the two lions, the focal point of the property, would remain in the garden to be sold along with their home. However, with worries that new owners might be unable to maintain and care for them properly, the Days came up with a clever plan to pass along caretaking to fellow garden enthusiasts and admirers of the lions, Fred Landman and Seen Lippert. Garden Conservancy Fellows and owners of Sleepy Cat Farm, also in Greenwich, Fred and Seen will welcome the lions onto their thirteen-acre garden and continue to share them with the public through their own Open Days. Lucy says that "anywhere at Sleepy Cat Farm would be appropriately regal for these lions."